In a fantastic start to its crucial final game stretch, Stony Brook Men’s Lacrosse beat UMass Lowell on the road 15-12 on Saturday, April 13. The win now gives the Seawolves a 3-1 America East conference record along with their 7-5 overall record. The River Hawks saw solid offensive efforts from junior attacker Dylan Rhatigan, who scored his career-high four points against the Seawolves, as well as two goals each from junior attacker Daniel Cozzi and sophomore attacker Jake Lining. The River Hawks managed to bring the game within one with three consecutive goals in the fourth quarter to make the score 10-9. Despite these efforts, the River Hawks were never able to keep up with the Seawolves, trailing Stony Brook the entire game. 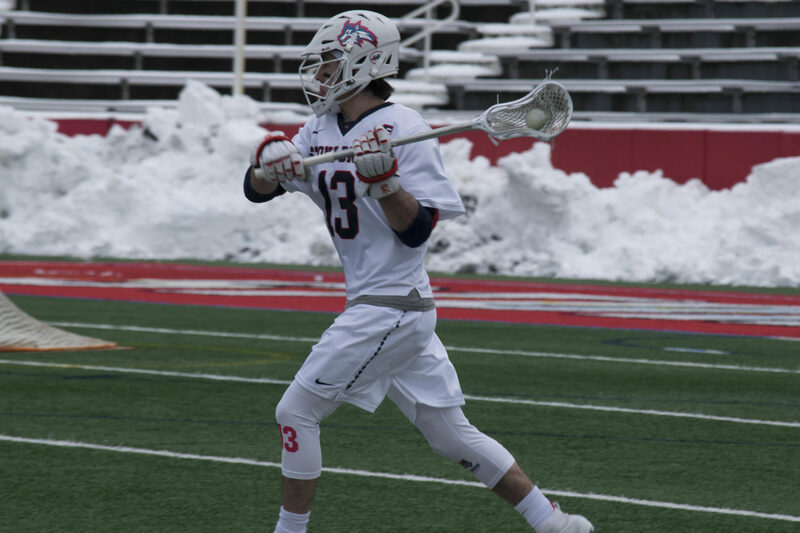 The Seawolves’ eight-player scoring offensive was led by junior attacker Tom Haun’s four goals, three of which came in the second half, including the victory-sealing shot. Junior attacker Chris Pickel Jr. scored a hat trick on the day, which is his fourth of the season. Junior attacker Connor Grippe and freshman midfielder Layton Harrell each scored two goals, with one a piece from senior long stick middie Justin Pugal, senior midfielder Owen Daly and sophomore midfielder Mike McCannell as well. Junior goalie Michael Bollinger kept the River Hawks out of the net with 11 saves on the day to keep the Seawolves ahead. In a turnaround fashion following their loss to the Princeton Tigers, the Seawolves shot very well, shooting 44 times with 33 shots on goal. The Seawolves’ remaining games, however, will be their toughest challenges. Both Vermont and Albany have clinched America East playoff berths and are currently ahead of Stony Brook in the rankings. The Seawolves next play the conference-leading 7-4 Vermont Catamounts at 12 p.m. on Saturday, April 20 at Virtue Field in Burlington, before closing the season off at home against Albany.